Norid operates within an international and a national framework. The administrative model for .no formalizes the national framework. Norid is the registry for the .no domain. This task was delegated from IANA, the Internet Assigned Numbers Authority, which originally held the international responsibility for delegating top-level domains. The function was transferred from IANA to ICANN in 1998. The framework for the delegation of top-level domains is described in RFC1591. This agreement is the actual and legal basis for Norid’s administration of the .no domain. Norid is thus organized on the basis of private-law rules and undertakes its activities with authorization in private-law contracts. 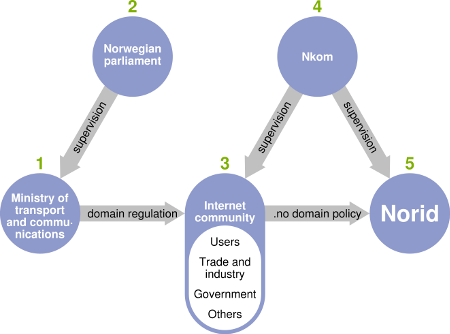 In 2002 a working group (in which Norid took part) under Norway’s Ministry of Transport and Communications prepared a proposal for formalization of the administrative model for the .no domain. The proposal was implemented in 2003 through a Domain Regulation, which in addition to RFC1591 specifies the framework for administration of the .no domain. Because the authorities only set the overall framework, a system is retained, where the registration service is operated within a private-law organization instead of being part of the public-sector administration. This makes it possible to maintain the advantages of the current model in the form of efficiency, low costs and flexibility. At the same time, through their framework function and supervisory function, the authorities can ensure that the service continues to be operated in a way that serves the Norwegian Internet community in the future.